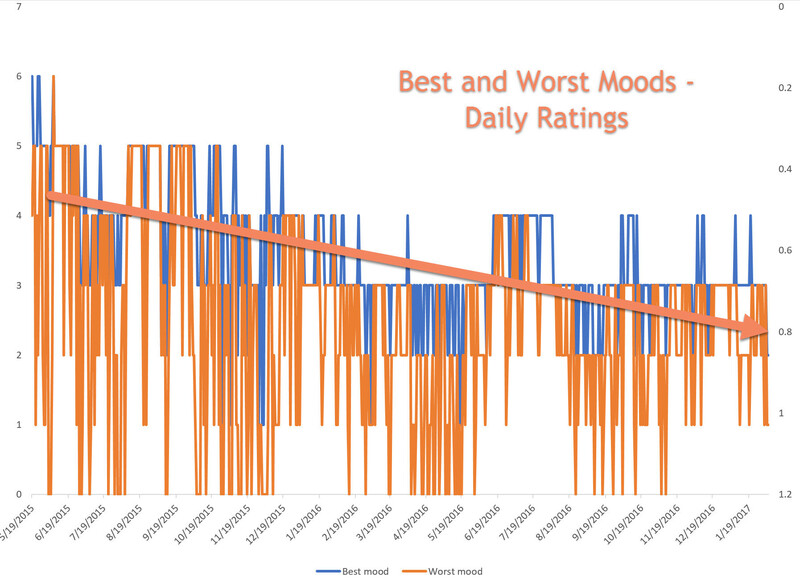 This sparked a lively conversation at dinner, but the next day I had a clinical example that I think perfectly illustrates the compelling value of doing so, despite all of the flaws inherent in trying to summarize complicated data about mood in a series of numbers. I knew of course that this would inevitably lead her to suicidal thoughts so I found myself suddenly immersed with her in that sense of hopelessness. This process is perhaps more common than you might imagine: pessimism and hopelessness can be quite contagious and even though I’m pretty good at avoiding getting caught up in it, sometimes it feels overwhelming. Pessimism and hopelessness can be quite contagious. It has been a lot of hard work for me as well as her trying to find adequate treatments for her depression. That also makes it easier to sink into pessimism. In our session, I said that I would take some time over the weekend and review the information that we have about her treatments and how she’s been doing over the course of the last couple of years. Because we have a couple of different ways that we have been keeping track of her mood – she has a daily mood check in, and a weekly Beck Depression Inventory that she fills out, and I also fill out a weekly inventory of depressive symptomatology – this process and the overlaying on it of data about her treatment experience took a couple of hours. It is not something that many or perhaps even most psychiatrists would do. Before I started the analysis, we thought that we knew one thing – mirtazapine definitely seemed to help her mood a few years ago when we started that medication. I also had a vague sense that there had been progress made since she first came in to see me, although she did not feel that was true. Daily Patient Mood Ratings. Lower is worse. Something about this theory just didn’t make sense. I recalled that she had just finished a period of three months without significant depression. Why was that not showing up in the results? 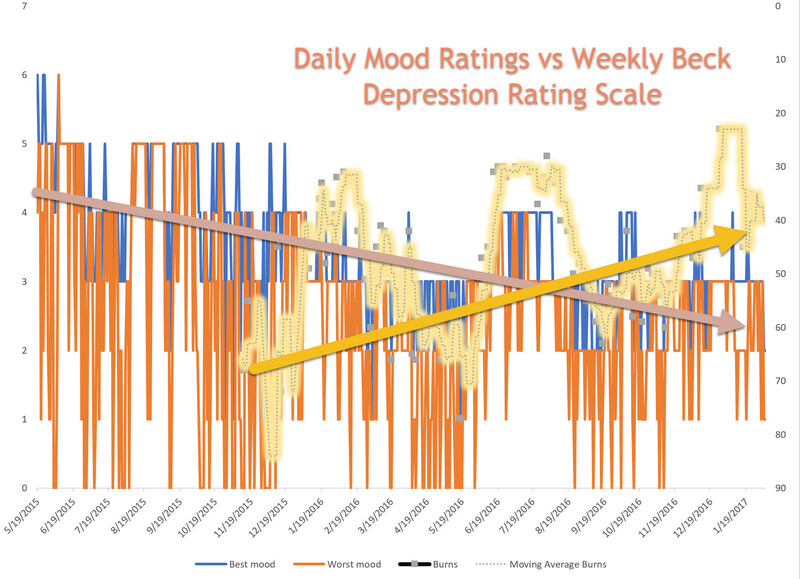 Daily Mood Ratings versus Weekly Beck Depression ratingssleep. Anchored questions are one of the reasons that standardized rating scales are often better than just asking “how are you?” The answer “great” or “OK” can mean many many different things. Finally, we added information about the treatments, including medications, that she had been receiving and this completed the story and allowed us to think much more constructively about what to do next. 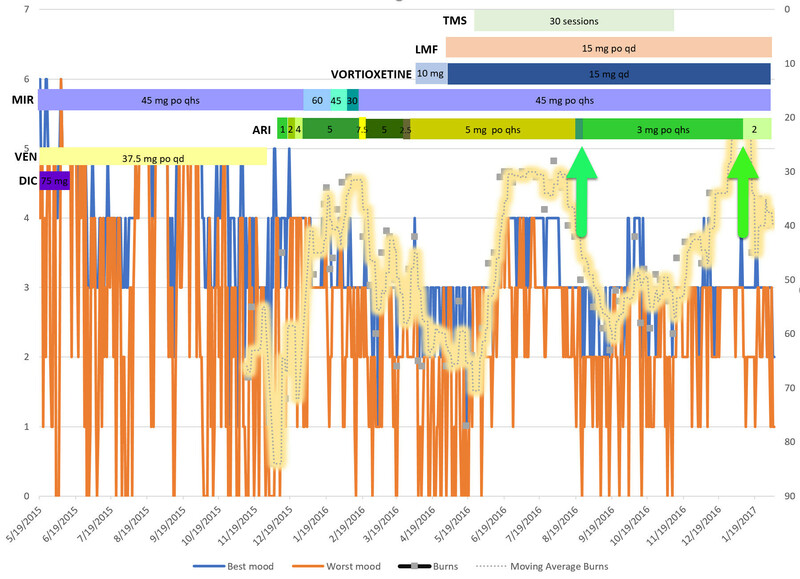 The medication information showed that each of those dips was associated with a decrease in her dose of one particular medication (aripriprazole). 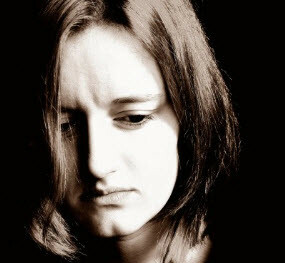 Aripiprazole reductions were associated with mood worsening.